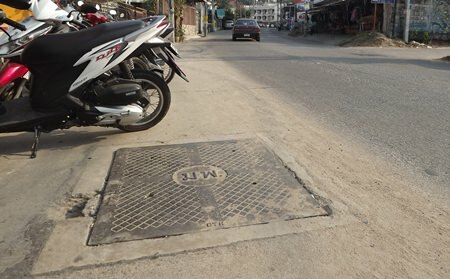 Soi Land Office residents are complaining that newly installed storm-drainage grates actually will make rainy season flooding worse. The grates, replaced last year, have only four small slits to allow water through. In addition, the grates are unevenly spaced on the soi. The result, residents worry, is that water will not drain equally or fast enough. 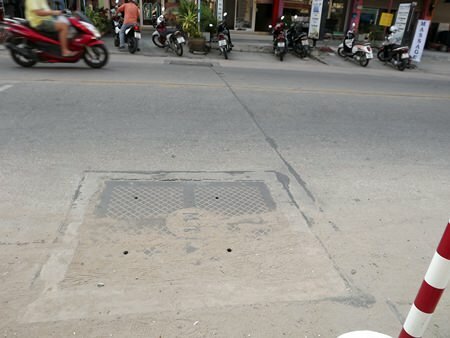 One of the newly installed storm-drainage lids with only 4 small holes which residents say will make rainy season flooding worse. Artid Hotagasab, 28, said he always has to pry up the drain covers in front of his house to let the rain water go down lest the water flow into his house. The area floods very easily because rain water is given so little space to escape the surface, he said. Therefore residents want the city to look into the problems and come up with solutions before rainy season hits.